Used Volkswagen Sharan Review - 1995-2011 | What Car? What's the used Volkswagen Sharan MPV like? 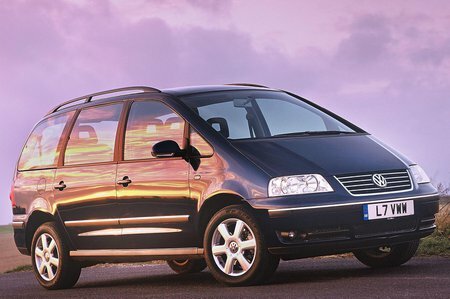 If you've driven a Ford Galaxy or Seat Alhambra, you've driven a Volkswagen Sharan. They're identical apart from differing levels of equipment and gentle corporate identity kits. They're also pretty good to drive. Like its brothers, the Sharan is tidy around corners, and while the ride is firm, it's never uncomfortably so, and becomes smoother at higher speeds. Cruising suits the Sharan well. All the engines are muted and the cabin is free from other intrusive noise. The seats are comfortable on long hauls, while the good driving position and fine all-round vision help shrink the miles, too. Last, but very definitely not least, the Sharan's practicality is very good. All seven seats can be folded and slid, while the five rearmost ones can be removed, given enough muscle and patience. Cargo space is huge when you do, but (in common with many other MPVs) it's very limited with all seven seats in place.